When Timo Kauppinen published the first version of Slicks 'n' Slide in 1993 he probably didn’t think that people would still be playing the game in the 2010s. The idea of the game was very simple – it’s a driving game that’s filmed from above so that the player can see the whole track on their screen at once. The controls are intuitive and simple, which made the game easy learn, so much so that anyone could grasp the concept after playing it once. There was a lot to learn in the game, many tracks and cars to choose from so that the best players could stand out. The fact that the game was easy to learn was important, but it being a multiplayer game was the main thing that made it a classic. Slicks 'n' Slide is a great example of a simple idea of a multiplayer game that stands the test of time. There are a couple of things that made it a great game to be played in a group – first of all, you could see the whole track on the screen at once, so everyone could see their own car no matter how well they were playing. Secondly, as we’ve mentioned, the game was very easy to learn with its simple controls. Up to four people could play the game at the same time with just one keyboard. The most important thing was that up to four people could play the game at the same time with just one keyboard! This combination was addictive and meant that the whole group of friends could play at the same time in a pretty snug atmosphere as everyone had to squeeze around one keyboard. This social aspect was the icing on the cake that made this simple game an excellent one. Many twenty- and thirty-somethings have great memories of the game exactly because of this reason, and especially the gamers who play a lot will recognize Slicks 'n' Slide as a concept that doesn’t need an explanation. Slicks 'n' Slide was and still is such a successful game that over the years many clones of the game have appeared. The most successful ones probably are GeneRally and Turbo Sliders, which have utilized the same kind of concept as Slicks 'n' Slide while just modernizing the graphics. Out of these two, GeneRally is the more well-known game and it definitely was better at using the Slicks 'n' Slide concept, but it doesn’t have the same kind of nostalgic value as the original Slicks 'n' Slide. They’ve also released a remake of Slicks 'n' Slide that - unlike the original - has disappeared over the years. There has also been a new version of Slicks 'n' Slide in development, but this java-based version of the game is not available online as we speak. You still have to pay to play the original version of the game. It only contains extra tracks and the ability to edit tracks, but otherwise it doesn’t differ from the free version. There are enough tracks and cars to start with to guarantee variation. The original version had around twenty tracks and multiple vehicles from a motorcycle to a UFO or even a tank. Every vehicle had its own strengths and weaknesses. You could change the settings to make the game the way you liked it – you could drive short or long races, turn off the crash mode, and so on. Technically you could have made the game into what you wanted, so no one could really complain about it. The game was perfect for short sessions during school breaks, as well as for longer gaming sessions where you’d race through all the tracks and compete against all the other players to see who’s really the best. The gaming sessions could be aggressive with everyone gritting their teeth, or more relaxed and easy like a Sunday morning…often the first though, as everyone would squeeze into a small space. The simple graphics work and they are pleasant to look at even today. This is yet again a testament to old simple games surviving the test of time. 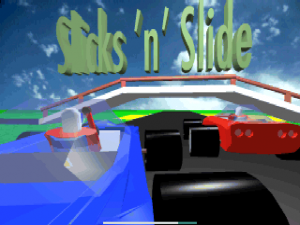 Slicks 'n' Slide is a classic game from the golden era of shareware game development. It was etched in our memories in childhood and adolescence during long intensive gaming sessions while squeezed around one keyboard. No wonder that this unassuming Finnish shareware game became an international hit that’s still remembered by many. Its real strength is that you could sit a young gamer in front of the console even today, and he’d enjoy the game the same way we did a couple of decades ago. You can’t really say the same about a lot of other games from that era, can you? ↑ nikoj, Suomipelit.com (2007-07-23), "Slicks 'n' Slide (1.30d) review" (in Finnish). Archived from the Suomipelit.com Game Database on 2015-05-16. Retrieved 2015-05-19. This page was last modified on 19 September 2017, at 06:01.